As I mentioned, it's 2nd and 21 after a Michigan sack. 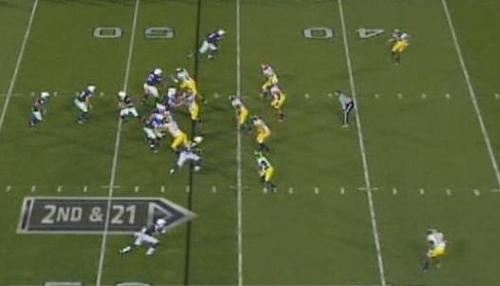 Michigan is showing a cover-3 look with a three-man rush and five underneath defenders. Penn State comes out with three receivers in an I-formation. They'll run play action, send their wide receivers down the field, and drag the slot receiver across the formation. James Rogers, Ray Vinopal, and JT Floyd will split the field into deep thirds. In what is very likely a passing down, Michigan has essentially eight men in the box. Penn State runs play action. 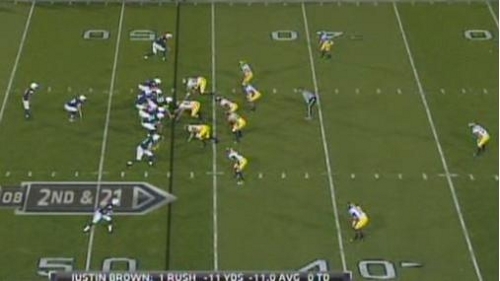 You can see Michigan's underneath defenders are all frozen in place, and all of which are between the hashes (!!). PSU's outside receivers are running straight downfield and the slot receiver is starting to come across the formation. While Michigan is susceptible to an easy 10-yard hitch route on this play, that's actually what they're hoping for: force PSU into a third and long and look for a stop then. This is where things get really ugly though. On what is now obviously a passing down, Michigan's underneath defenders are still all in the box and none is deeper than four yards from the line of scrimmage. 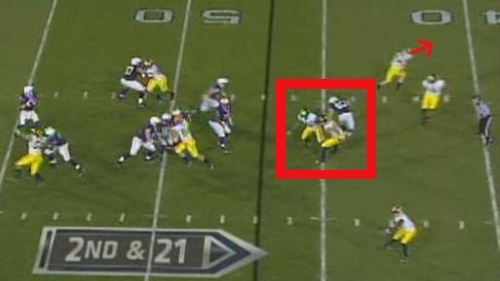 PSU is in a max protect set and has seven players blocking three Michigan defenders. To make matters worse, Kovacs and Gordon are both staring aimlessly into the flats where there's absolutely no PSU players. Michigan's linebackers are within five yards of one another, and all three are guarding the slot receiver dragging across the field. At this point, Kovacs realizes how poorly he's executed this play and has turned his head away from the quarterback to try and catch up with the outside receiver. Michigan's linebackers are literally running into each other and covering no one (What's happening here?). Michigan's underneath defenders are all still essentially inside the hash marks and none of them are deeper than five yards beyond the line of scrimmage. McGloin has all day to throw because, well, seven blockers against three rushers won't ever get to the quarterback. 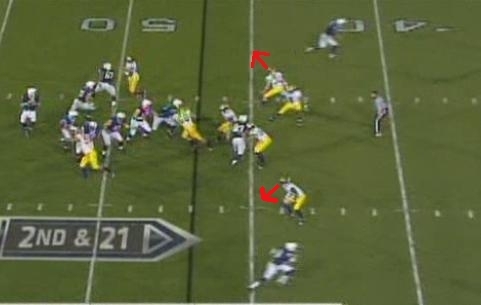 ...the PSU receiver takes one stop toward the inside of the field and then breaks to the outside. Floyd immediately turns his back on the play to run with the receiver to the inside, despite having help defense toward the middle of the field. By the time Floyd gets his head turned around, the receiver has settled into a completely vacated zone 22 yards down the field and makes the first down catch. Absolutely everyone involved in this play is to blame, but almost all of it has to fall on Greg Robinson. These players have absolutely no idea what they're doing here. The underneath defenders get no depth. Floyd doesn't know where his help defense is and once again shows how poor his technique is (like on those wide-open slants against Iowa) by turning away from the play. I mean, this is 2nd and 21 against a walk-on quarterback in the second drive of his first career start. How does this happen? You can say that the players didn't execute here, and that you can't blame this on Robinson when we don't know exactly how they were coached, but the massive amount of basic error is unfathomable for a team in its 8th game of the season, regardless of whether or not these are freshmen or seniors. I honestly don't know how a defense can be this clueless. No one on the field appears to know where they're supposed to be or how they're supposed to defend this. When this play was taught, what exactly did Robinson see that made him think, "Yes, that will work"? This is not a complex play with pattern reading or man coverage or stunts. This is a three-man rush with five underneath defenders and three deep safeties. Penn State sends only three receivers. And this isn't even one of those broken plays where defenses are forced to cover for too long. PSU's receiver ran 22 yards, stopped, and caught the football. There's no way to watch this and conclude anything other than massive failing on the behalf of the coaching staff and that Michigan has the worst defense in the country. 2009 looms. This is what happens when you add to the confusion by making semi-radical changes during one off week. Cam Gordon was clueless all night and considering he was playing a new position it's not too surprising. Nice job breaking this down. I've seen enough of Greg Robinson over the past 15 years than to know better than to blame him for nonsense like this. These kids deserve better direction and more consistency than what they've gotten over the past three years. Well done. I've never played organized football, and though I watch a ton of football, I generally just follow the ball in real time. Seeing it like this is insane. The shot of all five underneath guys essentially guarding one guy is priceless. I do play a lot of basketball and we run a 3-2 zone. Whenever I'm within touching distance of two other guys, I know we're screwed. Seems to be an exact parallel. Floyd is playing way too far off. The top WR is open from start to finish. Was he coached to play this far off? I don't know. But the link provided is how a cover-3 is supposed to be played. I'll post this at Mgoblog as well, which links to this your site. Toward the end of the play, I agree that he was playing too far off--most of this was his poor technique on the post fake by the receiver--but I believe he began the play at the correct depth. When you compare where he began to where the other safeties are on the field, it's reasonable to think that this is where they were coached to start. The bigger issue with how open the receivers are comes from the underneath defenders (specifically Gordon and Kovacs on the respective boundaries). Anything in front of the deep safeties should theoretically be cut off by the underneath defenders who drop into coverage. But the play action freezes all of them and the receiver has no one near him until running through Floyd's zone. The aforementioned post fake to the inside caused Floyd to turn from the play when he was in good position to defend the pass. Chris, my issue is with Floyd's depth at the start of the play--which I agree is what he has been coached to do. I disagree that he needs a 10 yard cushion when playing deep third. With only one man in his zone and the WR running deep, that becomes a man coverage for Floyd. Playing tighter to that WR renders him covered, plus Vinopal is free for safety help if the WR does go to the middle. I can't fault the kids for covering the way they're taught to cover. At some point, the CBs are just going to have to be trusted to cover a WR wihout a ten yard cushion. I disagree. By putting Floyd closer to the line, Michigan risks the chance of him being beaten at the snap, or shortly thereafter. Michigan doesn't line him up that deep because they're worried about a seam route; the concern is just getting straight beaten on a fly route down the sideline with no safety help. Floyd doesn't have man coverage on this receiver; not until he gets past the sticks is Floyd responsible for him one-on-one. Anywhere before the sticks is the responsibility of the underneath defenders, who don't get enough depth and also don't get far enough to the respective boundaries. There are a lot of issues that can be leveled against the coaching on this play, but Floyd's initial depth is not one of them. Chris, I see what you're saying about Kovacs getting to the flat and don't deny that. What I'm saying about it becoming man coverage for Floyd is that with one WR in the top 3rd of the field running a deep pattern Floyd is to cover him as if it is man coverage (especially on a seam or corner route) unless the WR vacates his zone to the middle. In my opinion, and the way I have played cover-3, I am playing 5 yards off, knowing that I am not to get beat deep or I'm getting benched. If Floyd is simply too slow to stay with a WR on a Seam route from an initial depth of 5 yards, then may God have mercy on his (beaten-deep) soul and my argument is completely moot anyway. Side note: I found your page as a link from Mgoblog. Keep up the good work as I enjoy the play breakdowns.